I do get excited about kitchen things. One that you’ve already heard me rave about is the All-Clad saucier pan. 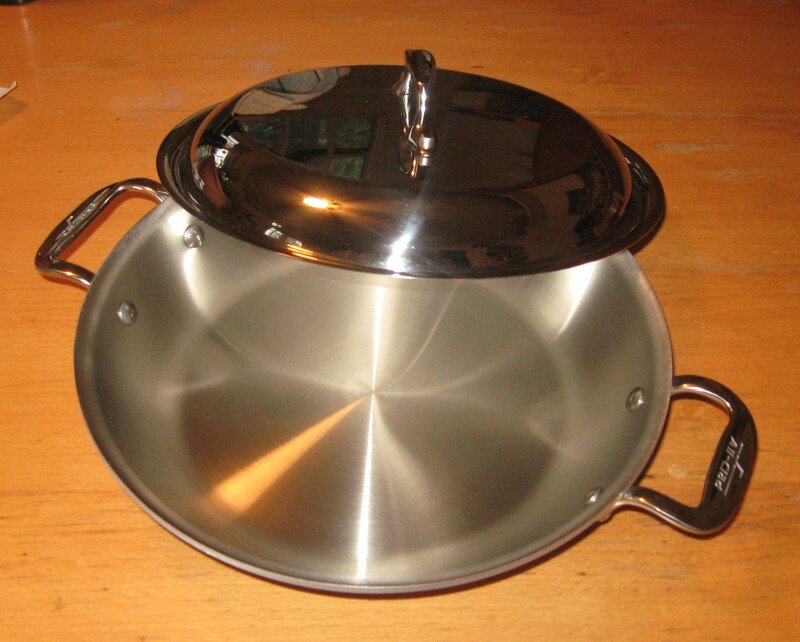 While I was browsing the Cooking.com website shortly before Christmas, I found what was listed as a 2-quart “petit brasier” by All-Clad. Since one of the cooking methods that I employ frequently is braising, I thought that sounded like something very useful for small-time cooking. I have had a Calphalon “everyday pan” for some time, that gets frequent use; it a similar shape–but it’s really too big when I’m doing single-serving cooking. This had all the advantages of that bigger pan: two short handles that make getting it in and out of the oven easy; sloped sides that make it useful as a skillet, and it goes easily from stove-top to oven since the handles are metal, plus one more: it’s size–small! I just could not resist, so by way of rationalization, it was considered a gift from my housemate, Keiko the cat. It arrived and looked just as fine as it had on the Cooking.com website. Here it is–fresh out of the box, just waiting for me to cook something. It had a good heft when I picked it up–just like all my other All-Clad cookware. It has had a thorough inspection by Keiko, so it’s now ready to used. Needless to say, I’m like a kid with a new toy. I spent a good deal of time mulling over what would be the most appropriate “test drive” for this new pan. I thought of the most traditional braised dish–pot roast, and not a fancy dish either. This will be just plain, down-home, country-style pot roast, with brown gravy. The recipe will be posted next week. I’m sure there will be something else braised on the menu soon. I’m sure this will be the usual All-Clad quality; it may turn out to be one of the most used pans in my kitchen, given how often I used the “every day” pan, even thought it was not the right size for solo cooking. You’ll get a further report in a short time, as well as recipes for braising for one. 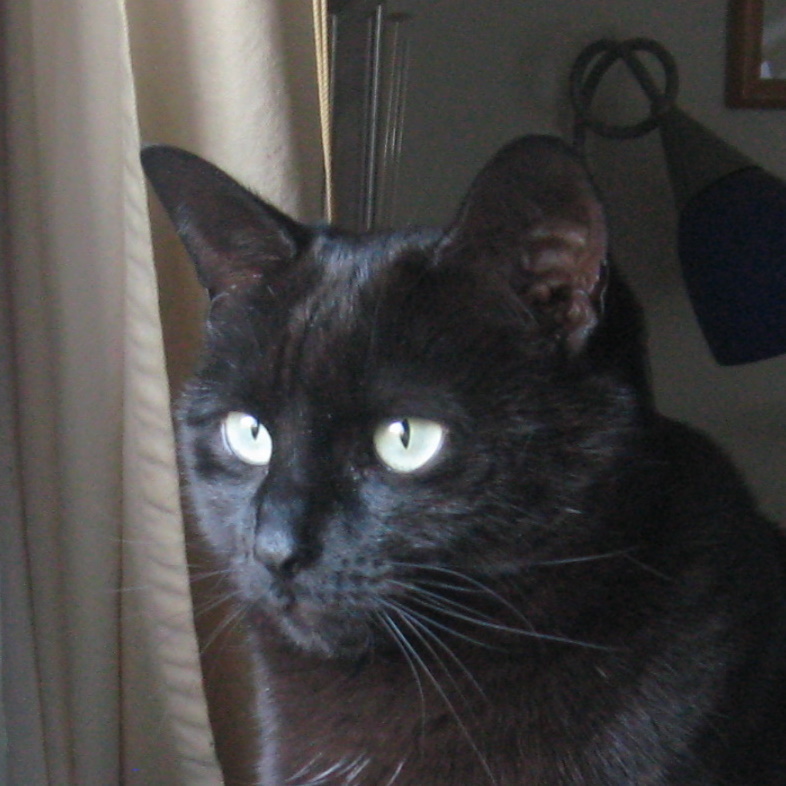 This is Keiko, the “fur person” to whom this gift is attributed; that was necessary as I had already decided what I was giving myself for Christmas–and it was not food-related. I’m sure she will be happy to check out what gets cooked in “her” pan. She’s only been with me since April, but she is turning into a very attentive kitchen cat–she comes and miaows at me immediately when a timer goes off and I’m slow to attend to it. So, thanks, Keiko, for a petit brasier for some small-time cooking while enjoying big-time taste!